The Foundation series is a science fiction book series written by American author Isaac Asimov. For nearly thirty years, the series was a trilogy: Foundation, Foundation and Empire, and Second Foundation. It won the one-time Hugo Award for "Best All-Time Series" in 1966. Asimov began adding to the series in 1981, with two sequels: Foundation's Edge, Foundation and Earth, and two prequels: Prelude to Foundation, Forward the Foundation. The additions made reference to events in Asimov's Robot and Empire series, indicating that they were also set in the same fictional universe. The premise of the series is that the mathematician Hari Seldon spent his life developing a branch of mathematics known as psychohistory, a concept of mathematical sociology. Using the laws of mass action, it can predict the future, but only on a large scale. Seldon foresees the imminent fall of the Galactic Empire, which encompasses the entire Milky Way, and a dark age lasting 30,000 years before a second great empire arises. Seldon's calculations also show there is a way to limit this interregnum to just one thousand years. To ensure the more favorable outcome and reduce human misery during the intervening period, Seldon creates the Foundation – a group of talented artisans and engineers positioned at the twinned extreme ends of the galaxy – to preserve and expand on humanity's collective knowledge, and thus become the foundation for the accelerated resurgence of this new galactic empire. The original trilogy of novels were originally a series of eight short stories published in Astounding Magazine between May 1942 and January 1950. According to Asimov, the premise was based on ideas set forth in Edward Gibbon's History of the Decline and Fall of the Roman Empire, and was invented spontaneously on his way to meet with editor John W. Campbell, with whom he developed the concepts of the collapse of the Galactic Empire, the civilization-preserving Foundations, and psychohistory. Asimov wrote these early stories in his West Philadelphia apartment when he worked at the Philadelphia Naval Yard. The first four stories were collected, along with a new story taking place before the others, as a fixup published by Gnome Press in 1951 as Foundation. The remainder of the stories were published in pairs by Gnome as Foundation and Empire (1952) and Second Foundation (1953), resulting in the "Foundation Trilogy", as the series is still known. In 1981, Asimov was persuaded by his publishers to write a fourth book, which became Foundation's Edge (1982). Four years later, Asimov followed up with yet another sequel, Foundation and Earth (1986), which was followed by the prequels Prelude to Foundation (1988) and Forward the Foundation (1993), published after his death in 1992. During the two-year lapse between writing the sequels and prequels, Asimov had tied in his Foundation series with his various other series, creating a single unified universe. The basic link is mentioned in Foundation's Edge: an obscure tradition about a first wave of space settlements with robots and then a second without. The idea is the one developed in Robots of Dawn, which, in addition to showing the way that the second wave of settlements were to be allowed, illustrates the benefits and shortcomings of the first wave of settlements and their so-called C/Fe (carbon/iron, signifying humans and robots together) culture. In this same book, the word psychohistory is used to describe the nascent idea of Seldon's work. Some of the drawbacks to this style of colonization, also called Spacer culture, are also exemplified by the events described in The Naked Sun. Note: This plot is listed in the fictional chronological order of the stories in the series, which is not the order of publication. The series itself was left as a trilogy for many years, comprising "Foundation", "Foundation and Empire" and "Second Foundation". The two novels set chronologically earlier than the original trilogy, and the two which follow it, were later added to the series. Prelude to Foundation opens on the planet Trantor, the empire's capital planet, the day after Hari Seldon has given a speech at a mathematics conference. Several parties become aware of the content of his speech (that using mathematical formulas, it may be possible to predict the future course of human history). Seldon is hounded by the Emperor and various employed thugs who are working surreptitiously, which forces him into exile. Over the course of the book, Seldon and Dors Venabili, a female companion and professor of history, are taken from location to location by Chetter Hummin who, under the guise of a reporter, introduces them to various Trantorian walks of life in his attempts to keep Seldon hidden from the Emperor. Throughout their adventures all over Trantor, Seldon continuously denies that psychohistory is a realistic science. Even if feasible, it may take several decades to develop. Hummin, however, is convinced that Seldon knows something, so he continuously presses him to work out a starting point to develop psychohistory. Eventually, after much traveling and introductions to various, diverse cultures on Trantor, Seldon realizes that using the entire known galaxy as a starting point is too overwhelming; he then decides to use Trantor as a model to work out the science, with a goal of later using the applied knowledge on the rest of the galaxy. Eight years after the events of Prelude, Seldon has worked out the science of psychohistory and has applied it on a galactic scale. His notability and fame increase and he is eventually promoted to First Minister to the Emperor. As the book progresses, Seldon loses those closest to him, including his wife, Dors Venabili, as his own health deteriorates into old age. Having worked his entire adult life to understand psychohistory, Seldon instructs his granddaughter, Wanda, to set up the Second Foundation. Called forth to stand trial on Trantor for allegations of treason (for foreshadowing the decline of the Galactic Empire), Seldon explains that his science of psychohistory foresees many alternatives, all of which result in the Galactic Empire eventually falling. If humanity follows its current path, the Empire will fall and 30,000 years of turmoil will overcome humanity before a second Empire arises. However, an alternative path allows for the intervening years to be only one thousand, if Seldon is allowed to collect the most intelligent minds and create a compendium of all human knowledge, entitled Encyclopedia Galactica. The board is still wary but allows Seldon to assemble whomever he needs, provided he and the "Encyclopedists" be exiled to a remote planet, Terminus. Seldon agrees to these terms – and also secretly establishes a second Foundation of which almost nothing is known, which he says is at the "opposite end" of the galaxy. After fifty years on Terminus, and with Seldon now deceased, the inhabitants find themselves in a crisis. With four powerful planets surrounding their own, the Encyclopedists have no defenses but their own intelligence. At the same time, a vault left by Seldon is due to automatically open. The vault reveals a pre-recorded hologram of Seldon, who informs the Encyclopedists that their entire reason for being on Terminus is a fraud, insofar as Seldon did not actually care whether or not an encyclopedia was created, only that the population was placed on Terminus and the events needed by his calculations were set in motion. In reality, the recording discloses, Terminus was set up to reduce the dark ages from 30,000 years to just one millennium, based on following his calculations. It will develop by facing intermittent and extreme "crises" – known as "Seldon Crises" – which the laws governing psychohistory show will inevitably be overcome, simply because human nature will cause events to fall in particular ways which lead to the intended goal. The recording reveals that the present events are the first such crisis, reminds them that a second foundation was also formed at the "opposite end" of the galaxy, and then falls silent. The Mayor of Terminus City, Salvor Hardin, proposes to play the planets against each other. His plan is a success; the Foundation remains untouched, and he is promoted to Mayor of Terminus (the planet). Meanwhile, the minds of the Foundation continue to develop newer and greater technologies which are smaller and more powerful than the Empire's equivalents. Using its scientific advantage, Terminus develops trade routes with nearby planets, eventually taking them over when its technology becomes a much-needed commodity. The interplanetary traders effectively become the new diplomats to other planets. One such trader, Hober Mallow, becomes powerful enough to challenge and win the seat of Mayor and, by cutting off supplies to a nearby region, also succeeds in adding more planets to the Foundation's reach. An ambitious general of the current Emperor of the Galaxy perceives the Foundation as a growing threat and orders an attack on it, using the Empire's still-mighty fleet of war vessels. The Emperor, initially supportive, becomes suspicious of his general's long-term motive for the attack, and recalls the fleet despite being close to victory. In spite of its undoubted inferiority in purely military terms, the Foundation emerges as the victor and the Empire itself is defeated. Seldon's hologram reappears in the vault on Terminus, and explains to the Foundation that this opening of the vault follows a conflict whose result was inevitable whatever might have been done – a weak Imperial navy could not have attacked them, while a strong navy would have shown itself by its successes to be a direct threat to the Emperor himself and been recalled. A century later, an unknown outsider called the Mule has begun taking over planets belonging to the Foundation at a rapid pace. The Foundation comes to realize the Mule is a mutant, unforeseen in Seldon's plan, and that the plan cannot have predicted any certainty of defeating him. Toran and Bayta Darell, accompanied by Ebling Mis – the galaxy's current greatest psychologist – and a court jester familiar with the Mule named Magnifico (whom they agree to protect, as his life is under threat from the Mule himself), set out to find the Second Foundation, hoping to bring an end to the Mule's reign. Mis studies furiously in the Great Library of Trantor to decipher the Second Foundation's location in order to visit it and seek their help. He is successful and also deduces that the Mule's success stems from his mutation; he is able to change the emotions of others, a power he used to first instill fear in the inhabitants of his conquered planets, then to make his enemies devoutly loyal to him. Mis is killed by Bayta Darell before he can reveal the location, having realised that Magnifico is in fact the Mule and has been using his gifts to drive Mis forward in his research, so that he can learn the location himself and subjugate the Second Foundation also. Dismayed at having made a mistake which allowed Bayta to see through his disguise, the Mule leaves Trantor to rule over his conquered planets while continuing his search. As the Mule comes closer to finding it, the mysterious Second Foundation comes briefly out of hiding to face the threat directly. It consists of the descendants of Seldon's psychohistorians. While the first Foundation has developed the physical sciences, the Second Foundation has been developing Seldon's mathematics and the Seldon Plan, along with their own use of mental sciences. The Second Foundation ultimately wears down the Mule, who returns to rule over his kingdom peacefully for the rest of his life, without any further thought of conquering the Second Foundation. However, as a result, the first Foundation has learned something of the Second Foundation beyond the simple fact that it exists, and has some understanding of its role. This means their behavior will now be chosen in light of that knowledge, and not based on uninformed natural human behavior, which means their behavior will no longer be the natural responses required by the mathematics of the Seldon Plan. This places the Plan itself at great risk. Additionally, the first Foundation instead starts to resentfully consider the other as a rival, and begins to develop equipment related to detecting and blocking mental influence, in order to detect members of the Second Foundation. After many attempts to unravel the Second Foundation's whereabouts from the minimal clues available, the Foundation is led to believe the Second Foundation is located on Terminus (being the "opposite end" of a galaxy, for a galaxy with a circular shape). The Foundation uncovers and destroys a group of fifty members of the Second Foundation and is left believing they have destroyed the Second Foundation. No longer concerned at the perceived threat, their behaviors as a society will tend to be those anticipated by the Plan. In fact the group of fifty were volunteers on Terminus whose role was to be captured and give the impression that they composed the whole of the Second Foundation, so that the Seldon Plan would be able to continue unimpeded. The Second Foundation, itself, is finally revealed to be located on the former Imperial Homeworld of Trantor. The clue "at Star's End" was not a physical clue, but was instead based on an old saying, "All roads lead to Trantor, and that is where all stars end." Seldon, being a social scientist and not a physical one, placed the two Foundations at "opposite ends" of the galaxy, but in a sociological rather than physical sense. The first Foundation was located on the Periphery of the galaxy, where the Empire's influence was minimal; the Second Foundation was on Trantor, where, even in its dying days, the Empire's power and culture was strongest. Believing the Second Foundation still exists (despite the common belief that it has been extinguished), young politician Golan Trevize is sent into exile by the current Mayor of the Foundation, Harla Branno, to uncover the Second Foundation; Trevize is accompanied by a scholar named Janov Pelorat. The reason for their belief is that, despite the unforeseeable impact of the Mule, the Seldon Plan still appears to be proceeding in accordance with the statements of Seldon's hologram, suggesting that the Second Foundation still exists and is secretly intervening to bring the plan back on course. After a few conversations with Pelorat, Trevize comes to believe that a mythical planet called Earth may hold the secret to the location. No such planet exists in any database, yet several myths and legends all refer to it, and it is Trevize's belief that the planet is deliberately being kept hidden. Unknown to Trevize and Pelorat, Branno is tracking their ship so that, in the event they find the Second Foundation, the first Foundation can take military or other action. Meanwhile, Stor Gendibal, a prominent member of the Second Foundation, discovers a simple local on Trantor who has had a very subtle alteration made to her mind, far more delicate than anything the Second Foundation can do. He concludes that a greater force of Mentalics must be active in the Galaxy. Following the events on Terminus, Gendibal endeavors to follow Trevize, reasoning that by doing so, he may find out who has altered the mind of the Trantor native. Using the few scraps of reliable information within the various myths, Trevize and Pelorat discover a planet called Gaia which is inhabited solely by Mentalics, to such an extent that every organism and inanimate object on the planet shares a common mind. Both Branno and Gendibal, who have separately followed Trevize, also reach Gaia at the same time. Gaia reveals that it has engineered this situation because it wishes to do what is best for humanity but cannot be sure what is best. Trevize's purpose, faced with the leaders of both the First and Second Foundations and Gaia itself, is to be trusted to make the best decision among the three main alternatives for the future of the human race: the First Foundation's path, based on mastery of the physical world and its traditional political organization (i.e., Empire); the Second Foundation's path, based on mentalics and probable rule by an elite using mind control; or Gaia's path of absorption of the entire Galaxy into one shared, harmonious living entity in which all beings, and the galaxy itself, would be a part. After Trevize makes his decision for Gaia's path, the intellect of Gaia adjusts both Branno's and Gendibal's minds so that each believes he or she has succeeded in a significant task. (Branno believes she has successfully negotiated a treaty tying Sayshell to the Foundation, and Gendibal – now leader (and First Speaker) of the Second Foundation – believes that the Second Foundation is victorious and should continue as normal.) Trevize remains, but is uncertain as to why he has intuited (is "sure") that Gaia is the correct outcome for the future. Still uncertain about his decision, Trevize continues on with the search for Earth along with Pelorat and a local of Gaia, advanced in Mentalics, known as Blissenobiarella (usually referred to simply as Bliss). Eventually, Trevize finds three sets of coordinates which are very old. Adjusting them for time, he realizes that his ship's computer does not list any planet in the vicinity of the coordinates. When he physically visits the locations, he rediscovers the forgotten worlds of Aurora, Solaria, and finally Melpomenia. After searching and facing different dilemmas on each planet, Trevize still has not discovered any answers. Aurora and Melpomenia are long deserted, but Solaria contains a small population which is extremely advanced in the field of Mentalics. When the lives of the group are threatened, Bliss uses her abilities (and the shared intellect of Gaia) to destroy the Solarian who is about to kill them. This leaves behind a small child who will be put to death if left alone, so Bliss makes the decision to keep the child as they quickly escape the planet. Eventually, Trevize discovers Earth, but it, again, contains no satisfactory answers for him (it is also long-since deserted). However, it dawns on Trevize that the answer may not be on Earth, but on Earth's satellite – the Moon. Upon approaching the planet, they are drawn inside the Moon's core, where they meet a robot named R. Daneel Olivaw. Olivaw explains that he has been instrumental in guiding human history for thousands of years, having provided the impetus for Seldon to create psychohistory and also the creation of Gaia, but is now close to the end of his ability to maintain himself and will cease to function. Despite replacing his positronic brain (which contain 20,000 years of memories), he is going to die shortly. He explains that no further robotic brain can be devised to replace his current one, or which will let him continue assisting for the benefit of humanity. However, some additional time can be won to ensure the long term benefit of humanity by merging R. Daniel Olivaw's mind with the organic intellect of a human – in this case, the intellect of the child that the group rescued on Solaria. Once again, Trevize is put in the position of deciding if having Olivaw meld with the child's superior intellect would be in the best interests of the galaxy. The decision is left ambiguous (though likely a "yes") as it is implied that the melding of the minds may be to the child's benefit, but that she may have sinister intentions about it. The early stories were inspired by Edward Gibbon's The History of the Decline and Fall of the Roman Empire. The plot of the series focuses on the growth and reach of the Foundation, against a backdrop of the "decline and fall of the Galactic Empire." The themes of Asimov's stories were also influenced by the political tendency in SF fandom, associated with the Futurians, known as Michelism. The focus of the books is the trends through which a civilization might progress, specifically seeking to analyze their progress, using history as a precedent. Although many science fiction novels such as Nineteen Eighty-Four or Fahrenheit 451 do this, their focus is upon how current trends in society might come to fruition, and act as a moral allegory on the modern world. The Foundation series, on the other hand, looks at the trends in a wider scope, dealing with societal evolution and adaptation rather than the human and cultural qualities at one point in time. Furthermore, the concept of psychohistory, which gives the events in the story a sense of rational fatalism, leaves little room for moralization. Hari Seldon himself hopes that his Plan will "reduce 30,000 years of Dark Ages and barbarism to a single millennium," a goal of exceptional moral gravity. Yet events within it are often treated as inevitable and necessary, rather than deviations from the greater good. For example, the Foundation slides gradually into oligarchy and dictatorship prior to the appearance of the galactic conqueror, known as the Mule, who was able to succeed through the random chance of a telepathic mutation. But, for the most part, the book treats the purpose of Seldon's plan as unquestionable, and that slide as being necessary in it, rather than mulling over whether the slide is, on the whole, positive or negative. The books also wrestle with the idea of individualism. Hari Seldon's plan is often treated as an inevitable mechanism of society, a vast mindless mob mentality of quadrillions of humans across the galaxy. Many in the series struggle against it, only to fail. However, the plan itself is reliant upon the cunning of individuals such as Salvor Hardin and Hober Mallow to make wise decisions that capitalize on the trends. On the other hand, the Mule, a single individual with mental powers, topples the Foundation and nearly destroys the Seldon plan with his special, unforeseen abilities. To repair the damage the Mule inflicts, the Second Foundation deploys a plan which turns upon individual reactions. Psychohistory is based on group trends and cannot predict with sufficient accuracy the effects of extraordinary, unforeseeable individuals, and as originally presented, the Second Foundation's purpose was to counter this flaw. Later novels would identify the Plan's uncertainties that remained at Seldon's death as the primary reason for the existence of the Second Foundation, which (unlike the First) had retained the capacity to research and further develop psychohistory. Asimov tried unsuccessfully to end the series with Second Foundation. However, because of the predicted thousand years until the rise of the next Empire (of which only a few hundred had elapsed), the series lacked a sense of closure. For decades, fans pressured him to write a sequel. In 1982, after a 30-year hiatus, Asimov gave in and wrote what was at the time a fourth volume: Foundation's Edge. This was followed shortly thereafter by Foundation and Earth. The story of this volume (which takes place some 500 years after Seldon) ties up all the loose ends and brings together all of his Robot, Empire, and Foundation novels into a single story. He also opens a brand new line of thought in the last dozen pages regarding Galaxia, a galaxy inhabited by a single collective mind. This concept was never explored further. According to his widow Janet Asimov (in her biography of Isaac, It's Been a Good Life), he had no idea how to continue after Foundation and Earth, so he started writing the prequels. The series is set in the same universe as Asimov's first published novel, Pebble in the Sky, although Foundation takes place about 10,000 years later. Pebble in the Sky became the basis for the Empire series. Then, at some unknown date (prior to writing Foundation's Edge) Asimov decided to merge the Foundation/Empire series with his Robot series. Thus, all three series are set in the same universe, giving them a combined length of 15 novels, and a total of about 1,500,000 words (see the List of books below). The merge also created a time-span of the series of around 20,000 years. The stand-alone story Nemesis is also in the same continuity; being referenced in Forward the Foundation, where Hari Seldon refers to a twenty-thousand-year-old story of "a young woman that could communicate with an entire planet that circled a sun named Nemesis." Commentators noted that Nemesis contains barely disguised references to the Spacers and their calendar system, the Galactic Empire and even to Hari Seldon which seem to have been deliberately placed for the purpose of later integration into the Foundation universe. Early on during Asimov's original world-building of the Foundation universe, he established within the first published stories a chronology placing the tales about 50,000 years into the future from the time they were written (circa 1940). This precept was maintained in the pages of his first novel Pebble in the Sky, wherein Imperial archaeologist Bel Arvardan refers to ancient human strata discovered in the Sirius sector dating back "some 50,000 years". However, when Asimov decided decades later to retroactively integrate the universe of his Foundation and Galactic Empire novels with that of his Robot stories, a number of changes and minor discrepancies surfaced – the character R. Daneel Olivaw was established as having existed for some 20,000 years, with the original Robot novels featuring the character occurring not more than a couple of millennia after the early-21st century Susan Calvin short stories. Also, in Foundation's Edge, mankind was referred to as having possessed interstellar space travel for only 22,000 years, a far cry from the 50 millennia of earlier works. In the spring of 1955, Asimov published an early timeline in the pages of Thrilling Wonder Stories magazine based upon his thought processes concerning the Foundation universe's history at that point in his life, which vastly differs from its modern-era counterpart. Many included stories would later be either jettisoned from the later chronology or temporally relocated by the author. Also, the aforementioned lengthier scope of time was changed. For example, in the original 1950s timeline, humanity does not discover the hyperspatial drive until around 5000 AD, whereas in the reincorporated Robot universe chronology, the first interstellar jump occurs in 2029 AD, during the events of I, Robot. Below is a summarized timeline for events detailed in the series. All dates are quoted in Galactic Era (GE) and Foundation Era (FE) which starts in 12,068 GE. 11,988 −78 Hari Seldon and Cleon I are born on Helicon and Trantor, respectively. 12,010 −56 Cleon I is crowned emperor after the death of his father, Stanel VI. 12,038 −28 Death of Emperor Cleon I (Events of "Cleon I" in Forward the Foundation). 12,085/12,086 17 or 18 Salvor Hardin is born. ~12,328 ~260 A rebel leader named Gilmer attempts a coup, in the process sacks Trantor and forces the imperial family to flee to the nearby world of Delicass, renamed Neotrantor. The Galactic Empire is no more. The dark age of the entire Milky Way has begun. 12,428 362 Arkady Darell is born. 12,443 377 Battle of Quoriston between Lord Stettin and the Foundation. 13,086 1020 116th Edition of the Encyclopedia Galactica is published. 16,068 4000 Approximate culmination of Galaxia. Asimov's novels covered only 500 of the expected 1,000 years it would take for the Foundation to become a galactic empire. The novels written after Asimov did not continue the timeline but rather sought to fill in gaps in the earlier stories. The Foundation universe was once again revisited in 1989's Foundation's Friends, a collection of short stories written by many prominent science fiction authors of that time. Orson Scott Card's "The Originist" clarifies the founding of the Second Foundation shortly after Seldon's death; Harry Turtledove's "Trantor Falls" tells of the efforts by the Second Foundation to survive during the sacking of Trantor, the imperial capital and Second Foundation's home; and George Zebrowski's "Foundation's Conscience" is about the efforts of a historian to document Seldon's work following the rise of the Second Galactic Empire. Also, shortly before his death in 1992, Asimov approved an outline for three novels, known as the Caliban trilogy by Roger MacBride Allen, set between Robots and Empire and the Empire series. The Caliban trilogy describes the terraforming of the Spacer world Inferno, a planet where an ecological crisis forces the Spacers to abandon many long-cherished parts of their culture. Allen's novels echo the uncertainties that Asimov's later books express about the Three Laws of Robotics, and in particular the way a thoroughly roboticized culture can degrade human initiative. After Asimov's death and at the request of Janet Asimov and the Asimov estate's representative, Ralph Vicinanza approached Gregory Benford, and asked him to write another Foundation story. He eventually agreed, and with Vicinanza and after speaking "to several authors about [the] project", formed a plan for a trilogy with "two hard SF writers broadly influenced by Asimov and of unchallenged technical ability: Greg Bear and David Brin." 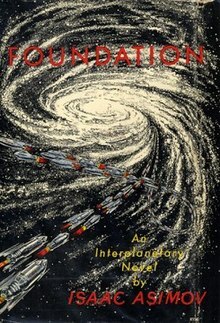 Foundation's Fear (1997) takes place chronologically between part one and part two of Asimov's second prequel novel, Forward the Foundation; Foundation and Chaos (1998) is set at the same time as the first chapter of Foundation, filling in background; Foundation's Triumph (1999) covers ground following the recording of the holographic messages to the Foundation, and ties together a number of loose ends. These books are now claimed by some to collectively be a "Second Foundation trilogy", although they are inserts into pre-existing prequels and some of the earlier Foundation storylines and not generally recognized as a new Trilogy. In an epilogue to Foundation's Triumph, Brin noted he could imagine himself or a different author writing another sequel to add to Foundation's Triumph, feeling that Hari Seldon's story was not yet necessarily finished. He later published a possible start of such a book on his website. More recently, the Asimov estate authorized publication of another trilogy of robot mysteries by Mark W. Tiedemann. These novels, which take place several years before Asimov's Robots and Empire, are Mirage (2000), Chimera (2001), and Aurora (2002). These were followed by yet another robot mystery, Alexander C. Irvine's Have Robot, Will Travel (2004), set five years after the Tiedemann trilogy. In 2001, Donald Kingsbury published the novel Psychohistorical Crisis, set in the Foundation universe after the start of the Second Empire. Novels by various authors (Isaac Asimov's Robot City, Robots and Aliens and Robots in Time series) are loosely connected to the Robot series, but contain many inconsistencies with Asimov's books, and are not generally considered part of the Foundation series. In November 2009, the Isaac Asimov estate announced the upcoming publication of Robots and Chaos, the first volume in a trilogy featuring Susan Calvin by fantasy author Mickey Zucker Reichert. The book was published in November 2011 under the title I, Robot: To Protect, followed by I, Robot: To Obey in 2013 and I, Robot: To Preserve in 2016. In Learned Optimism, psychologist Martin Seligman identifies the Foundation series as one of the most important influences in his professional life, because of the possibility of predictive sociology based on psychological principles. He also lays claim to the first successful prediction of a major historical (sociological) event, in the 1988 US elections, and he specifically attributes this to a psychological principle. In his 1996 book To Renew America, U. S. House Speaker Newt Gingrich wrote how he was influenced by reading the Foundation trilogy in high school. Paul Krugman, winner of the 2008 Nobel Memorial Prize in Economic Sciences, credits the Foundation series with turning his mind to economics, as the closest existing science to psychohistory. Businessman and entrepreneur Elon Musk counts the series among the inspirations for his career. When Musk's Tesla Roadster was launched into space on the maiden flight of the Falcon Heavy rocket in February 2018, amongst other items it carried a copy of the Foundation series. Stating that it "offers a useful summary of some of the dynamics of far‐flung imperial Rome", Carl Sagan in 1978 listed the Foundation series as an example of how science fiction "can convey bits and pieces, hints and phrases, of knowledge unknown or inaccessible to the reader". In the nonfiction PBS series Cosmos: A Personal Voyage, Sagan referred to an Encyclopedia Galactica in the episodes "Encyclopaedia Galactica" and "Who Speaks for Earth". In 1966, the Foundation trilogy beat several other science fiction and fantasy series to receive a special Hugo Award for "Best All-Time Series". The runners-up for the award were Barsoom series by Edgar Rice Burroughs, Future History series by Robert A. Heinlein, Lensman series by Edward E. Smith and The Lord of the Rings by J. R. R. Tolkien. The Foundation series is still the only series so honored. Asimov himself wrote that he assumed the one-time award had been created to honor The Lord of the Rings, and he was amazed when his work won. The series has won three other Hugo Awards. Foundation's Edge won Best Novel in 1983, and was a bestseller for almost a year. Retrospective Hugo Awards were given in 1996 and 2018 for, respectively, "The Mule" (the major part of Foundation and Empire) for Best Novel (1946) and "Foundation" (the first story written for the series, and second chapter of the first novel) for Best Short Story (1943). Science fiction parodies, such as Douglas Adams' The Hitchhiker's Guide to the Galaxy and Harry Harrison's Bill, the Galactic Hero, often display clear Foundation influences. For instance, "The Guide" of the former is a spoof of the Encyclopedia Galactica, and the series actually mentions the encyclopedia by name, remarking that it is rather "dry", and consequently sells fewer copies than the guide; the latter also features the ultra-urbanized Imperial planet Helior, often parodying the logistics such a planet-city would require, but that Asimov's novel downplays when describing Trantor. In 1995, Donald Kingsbury wrote "Historical Crisis", which he later expanded into a novel, Psychohistorical Crisis. It takes place about 2,000 years after Foundation, after the founding of the Second Galactic Empire. It is set in the same fictional universe as the Foundation series, in considerable detail, but with virtually all Foundation-specific names either changed (e.g., Kalgan becomes Lakgan), or avoided (psychohistory is created by an unnamed, but often-referenced Founder). The novel explores the ideas of psychohistory in a number of new directions, inspired by more recent developments in mathematics and computer science, as well as by new ideas in science fiction itself. In 1998, the novel Spectre (Star Trek) (part of the Shatnerverse series) by William Shatner and Judith and Garfield Reeves-Stevens states that the Mirror Universe divergent path has been studied by the Seldon Psychohistory Institute. The oboe-like holophonor in Matt Groening's animated television series Futurama is based directly upon the "Visi-Sonor" which Magnifico plays in Foundation and Empire. The "Visi-Sonor" is also mirrored in an episode of Special Unit 2, where a child's television character plays an instrument that induces mind control over children. During the 2006–2007 Marvel Comics Civil War crossover storyline, in Fantastic Four #542 Mister Fantastic revealed his own attempt to develop psychohistory, saying he was inspired after reading the Foundation series. According to lead singer Ian Gillan, the hard rock band Deep Purple's song The Mule is based on the Foundation character: "Yes, The Mule was inspired by Asimov. It's been a while but I'm sure you've made the right connection...Asimov was required reading in the 60's." An eight-part radio adaptation of the original trilogy, with sound design by the BBC Radiophonic Workshop, was broadcast on BBC Radio 3 in 1973 – one of the first BBC radio drama serials to be made in stereo. A BBC 7 rerun commenced in July 2003. Adapted by Patrick Tull (episodes 1 to 4) and Mike Stott (episodes 5 to 8), the dramatisation was directed by David Cain and starred William Eedle as Hari Seldon, with Geoffrey Beevers as Gaal Dornick, Lee Montague as Salvor Hardin, Julian Glover as Hober Mallow, Dinsdale Landen as Bel Riose, Maurice Denham as Ebling Mis and Prunella Scales as Lady Callia. By 1998, New Line Cinema had spent $1.5 million developing a film version of the Foundation Trilogy. The failure to develop a new franchise was partly a reason the studio signed on to produce The Lord of the Rings film trilogy. On July 29, 2008, New Line Cinema co-founders Bob Shaye and Michael Lynne were reported to have been signed on to produce an adaptation of the trilogy by their company Unique Pictures for Warner Brothers. However, Columbia Pictures (Sony) successfully bid for the screen rights on January 15, 2009, and then contracted Roland Emmerich to direct and produce. Michael Wimer was named as co-producer. Two years later, the studio hired Dante Harper to adapt the books. This project failed to materialize and HBO acquired the rights when they became available in 2014. In November 2014, TheWrap reported that Jonathan Nolan was writing and producing a TV series based on the Foundation Trilogy for HBO. Nolan confirmed his involvement at a Paley Center event on April 13, 2015. In June 2017, Deadline reported that Skydance Media will produce a TV series. In August 2018 it was announced that Apple has commissioned a 10 episode straight-to-series order. The "Author's Note" of Prelude to Foundation contains the chronological ordering of Asimov's science fiction books, in which he also said, "they were not written in the order in which (perhaps) they should be read". Forward the Foundation does not appear in Asimov's list, as it was not yet published at the time, and the order of the Empire novels in Asimov's list is not entirely consistent with other lists. For example, the 1983 Ballantine Books printing of The Robots of Dawn lists the Empire novels as: The Stars, Like Dust, The Currents of Space, and Pebble in the Sky. Given that The Currents of Space includes Trantor and that The Stars, Like Dust does not, these two books possibly were accidentally reversed in Asimov's list. 1950 I, Robot Robot short stories. First collection, which were all included in The Complete Robot, though it also contains a binding text, no longer in The Complete Robot. 1964 The Rest of the Robots Robot short stories. Second collection, which were all included in The Complete Robot. 1 1982 The Complete Robot Collection of thirty-one Robot short stories written between 1939 and 1977. 1986 Robot Dreams Robot short stories. Anthologized in a book with the same title. 1990 Robot Visions Robot short stories. Anthologized in a book with the same title. 2 1954 The Caves of Steel This is the first of the Robot novels. 3 1957 The Naked Sun The second Robot novel. 1972 "Mirror Image" Written after having received numerous requests to continue the story of detective Elijah Baley and his robot partner R. Daneel Olivaw, featured in his earlier novels The Caves of Steel and The Naked Sun. Published in The Complete Robot. 4 1983 The Robots of Dawn The third Robot novel. 2000 Mirage Robot Mystery series by Mark W. Tiedemann. 2001 Chimera Robot Mystery series by Mark W. Tiedemann. 2002 Aurora Robot Mystery series by Mark W. Tiedemann. 2005 Have Robot, Will Travel Robot Mystery series by Alexander C. Irvine. 5 1985 Robots and Empire The fourth Robot novel. 1993 Isaac Asimov's Caliban Caliban trilogy by Roger MacBride Allen. 1994 Isaac Asimov's Inferno Caliban trilogy by Roger MacBride Allen. 1996 Isaac Asimov's Utopia Caliban trilogy by Roger MacBride Allen. 6 1951 The Stars, Like Dust The first Empire novel. 7 1952 The Currents of Space The second Empire novel. 8 1950 Pebble in the Sky The third Empire novel; however, it was Asimov's first full novel to be published. 1945 "Blind Alley" Short story set in the Foundation universe. Published in the March/1945 issue of Astounding Science Fiction, and later included in the collection The Early Asimov (1972). 9 1988 Prelude to Foundation This is the first Foundation novel. 10[note 1] 1993 Forward the Foundation The second Foundation novel (although it was the last written by Asimov himself). 1997 Foundation's Fear The first book of the Second Foundation trilogy by Gregory Benford. 1998 Foundation and Chaos The second book of the Second Foundation trilogy by Greg Bear. 1999 Foundation's Triumph The third book of the Second Foundation trilogy by David Brin. 11 1951 Foundation The third Foundation novel. Actually, it is a collection of four stories, originally published between 1942 and 1944, plus an introductory section written for the book in 1949. Published, slightly abridged, as part of an Ace Double paperback, D-110, with the title The 1000-Year Plan, in 1955. 12 1952 Foundation and Empire The fourth Foundation novel, made up of two stories, originally published in 1945. Published with the title The Man Who Upset the Universe as a 35c Ace paperback, D-125, in about 1952. 13 1953 Second Foundation The fifth Foundation novel, made up of two stories, originally published in 1948 and 1949. 14 1982 Foundation's Edge The sixth Foundation novel. 15 1986 Foundation and Earth The seventh Foundation novel. Another alternative is to read the books in their original order of publication, since reading the Foundation prequels prior to reading the Foundation Trilogy fundamentally alters the original narrative structure of the trilogy by spoiling what were originally presented as plot surprises. [original research?] In that same Author's Note, Asimov noted that there is room for a book between Robots and Empire (5) and The Currents of Space (6), and that he could follow Foundation and Earth (15) with additional volumes. While not mentioned in the above list, the books The End of Eternity (1955) and Nemesis (1989) are also referenced in the series. The End of Eternity is vaguely referenced in Foundation's Edge, where a character mentions the Eternals, whose "task it was to choose a reality that would be most suitable to Humanity". (The End of Eternity also refers to a "Galactic Empire" within its story.) In Forward the Foundation, Hari Seldon refers to a 20-thousand-year-old story of "a young woman that could communicate with an entire planet that circled a sun named Nemesis", a reference to Nemesis. In Nemesis, the main colony is one of the Fifty Settlements, a collection of orbital colonies that form a state. The Fifty Settlements possibly were the basis for the fifty Spacer worlds in the Robot stories. The implication at the end of Nemesis that the inhabitants of the off-Earth colonies are splitting off from Earthbound humans could also be connected to a similar implication about the Spacers in Mark W. Tiedemann's Robot books. On the other hand, these references might be just jokes by Asimov, and the stories mentioned could be just those really written by himself (as seen in The Robots of Dawn, where Fastolfe makes a reference to Asimov's Liar!) and still being read twenty thousand years later. Furthermore, Asimov himself did not mention The End of Eternity in the series listing from Prelude to Foundation. As for Nemesis, it was written after Prelude to Foundation, but in the author's note Asimov explicitly states that the book is not part of the Foundation or Empire series, but that some day he might tie it to the others. R. Daneel Olivaw, a humanoid robot who organizes the creation of both the Seldon plan and Gaia and Galaxia, he also assumes the names Chetter Hummin and Eto Demerzel (First Minister). Dors Venabili, Seldon's wife and protector, known as the "Tiger Woman" for her physical prowess and swiftness to action, she is eventually revealed to be a humanoid robot like Daneel. Salvor Hardin, first mayor of Terminus, first Foundationer to realize the "farce" of the Encyclopedia Galactica. Bayta Darell, Foundation citizen instrumental in the defeat of the Mule. Golan Trevize, councilman of Terminus who discovers the secret location of Earth. The main character of "Foundation Edge" and "Foundation and Earth". He chose Galaxia as the fate of the galaxy. ^ The final section of Forward the Foundation, Epilogue, appears to directly precede Hari Seldon's death. Therefore at least this part of the book would be located after the events of Foundation and Chaos, Foundation's Triumph and the first chapter of Foundation. ^ "1966 Hugo Awards". thehugoawards.org. Hugo Award. Retrieved July 28, 2017. ^ "The Long List of Hugo Awards, 1966". New England Science Fiction Association. Retrieved July 28, 2017. ^ Asimov, Isaac. La edad de oro II. Plaza & Janes. 1987. P 252–253 (Spanish language translation of The Early Asimov) See afterword for the "Legal Rites" story. ^ ISAAC ASIMOV (1982). Foundation's Edge. Halmstad: Spectra. p. 1. ISBN 0-553-29338-9. ^ ISAAC ASIMOV. Foundation and Earth. Halmstad: Spectra. ISBN 0-553-58757-9. ^ Codex, Regius (2014). From Robots to Foundations. Wiesbaden/Ljubljana. ISBN 1499569823. ^ "An Early Asimov Timeline". Asimovreviews.net. 2006-02-14. Retrieved 2013-07-08. ^ Turtledove, Harry. "Trantor Falls." Foundation's Friends, edited by Martin H. Greenberg. Tor, 1989. ^ sikander. "TimeLine for the Robots & Foundations Universe". www.sikander.org. ^ "The Second Foundation Series - Kaedrin's Guide to Isaac Asimov". kaedrin.com. ^ Serfer, David Brin, Runaway. "worlds of DAVID BRIN". www.davidbrin.com. ^ "Series: Isaac Asimov's I, Robot". www.isfdb.org. ^ Seligman, Martin. Learned Optimism ((c) 1998 by Alfred A. Knopf, Inc.), 185ff. ^ Seligman discusses the successful prediction of the Presidential and 33 Senatorial elections based on an evaluation of the candidates' optimism as expressed in their speeches, and the principle that American voters systematically favor optimistic candidates. ^ "Newt Gingrich the Galactic Historian". Ray Smock, History News Network, 08 December 2011. ^ Krugman, Paul (4 December 2012). "Paul Krugman: Asimov's Foundation novels grounded my economics". the Guardian. ^ "U.S. Economist Krugman Wins Nobel Prize in Economics". ^ "Elon Musk successfully launched his Tesla into orbit on SpaceX's Falcon Heavy rocket". USA Today. February 6, 2018. ^ "1966 Hugo Awards". 26 July 2007. ^ Asimov, Isaac (1980). In Joy Still Felt: The Autobiography of Isaac Asimov, 1954–1978. Garden City, New York: Doubleday. chapter 24. ISBN 0-385-15544-1. ^ Cohen, David X. (2003). Futurama season 4 DVD commentary for the episode "The Devil's Hands Are Idle Playthings" (DVD). 20th Century Fox. Of course, you'll remember the holophonor [...] as we've said [...] is inspired by an instrument in [...] Foundation, one of the Foundation books, Isaac Asimov, the Mule plays an instrument much like that, except that it controls peoples minds. ^ "Caramba - Q&a". www.gillan.com. ^ Sibley, Brian (2006). "Three-Ring Circus". Peter Jackson: A Film-maker's Journey. London: Harpercollins. p. 403. ISBN 0-00-717558-2. ^ Rich Drees (2008-07-29). "FOUNDATION Heading To Big Screen". Film Buff OnLine. Retrieved 2008-07-29. ^ a b Sneider, Jeff (10 November 2014). "'Interstellar's' Jonah Nolan Developing 'Foundation' Series for HBO, WBTV (Exclusive)". TheWrap. Retrieved 11 November 2014. ^ "PaleyLive: An Evening with the Cast of Person of Interest". Yahoo. 13 April 2015. Retrieved 14 April 2015. ^ Fleming, Mike, Jr. (27 June 2017). "Skydance Trying Asimov's 'Foundation' As TV Series; David Goyer, Josh Friedman To Adapt". Deadline Hollywood. Retrieved 27 June 2017. ^ "'Foundation': Apple Gives Series Order To Adaptation Of Isaac Asimov's Sci-Fi Classic From David Goyer & Josh Friedman". Deadline Hollywood. 23 August 2018. Retrieved 29 August 2018. ^ Asimov, Isaac (1988). Prelude to Foundation. New York, NY: Bantam Dell. ISBN 978-0-553-90095-8. ^ "The Complete Robot". Kitsap Regional Library. Retrieved 25 June 2017. ^ a b "1984 Award Winners & Nominees". Worlds Without End. Retrieved 2009-09-13. ^ "1986 Award Winners & Nominees". Worlds Without End. Retrieved 2009-09-13. ^ "1989 Award Winners & Nominees". Worlds Without End. Retrieved 2009-09-13. ^ "1982 Award Winners & Nominees". Worlds Without End. Retrieved 2009-09-13. ^ a b "1983 Award Winners & Nominees". Worlds Without End. Retrieved 2009-09-13. ^ "1987 Award Winners & Nominees". Worlds Without End. Retrieved 2009-09-13.